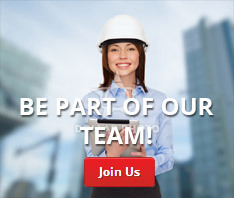 RVI is a cost-effective inspection technique used to capture real-time views and images from inside voids such as tubes, pipes, rotating machinery, engines, heat exchangers, tray towers, refractory-lined vessels and enclosed structures. RVI can be a perfect complementary technique to other NDT disciplines and is frequently used as the primary or initial inspection screening method to find localized corrosion and erosion. GE’s Inspection Technologies business brings you an array of VideoProbe® systems, a comprehensive offering of technologically advanced video borescopes that are diverse enough to meet your application-specific needs. Plug them in, turn them on – our video borescope systems are designed for ease of use while delivering video images of unsurpassed quality. 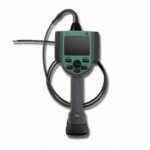 Distinguished by an intuitive, patented joystick and one-handed operation, the VideoProbe systems feature an integrated LCD video display and a variety of imaging and measurement functions to meet your inspection needs. Engineered for durability and available in many diameters and lengths, video borescopes can be used for a wide range of industry applications. 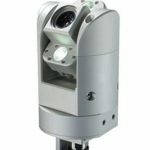 For remote viewing in large areas, GE’s Inspection Technologies business offers a full range of rugged, industrial Pan-Tilt-Zoom (PTZ) cameras. Each system features a color zoom camera module, high-intensity lighting, pan-and-tilt mechanism and industrial waterproof packaging for protection from extreme environments. Each ptz camera features unique options for specific industrial applications, so choose the model that is right for you. 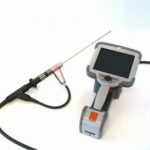 Detect subtle irregularities in castings, ensure the structural integrity of an aircraft engine or diagnose the cause of an automobile squeak or rattle—nothing gets by the exceptional clarity and high precision optics of our rigid borescopes. Rigid borescopes are exceptionally durable with all-metal construction and a triple tube shaft design built to withstand the harsh environments of an industrial inspection. Our selection of industrial rigid borescopes includes Rotary Scan, Swing Prism, and Mini Rigid designs. 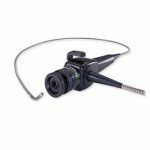 To enhance the versatility and performance of our rigid borescopes, choose from a broad selection of accessories including eyepiece adapters, video borescope adapters, monitors, recording devices, light guides and light sources. GE’s Inspection Technologies business brings you high-resolution articulating fiberscopes featuring 7-micron diameter, densely-packed, imaging fibers to reveal more detail than any other scopes. Our line of flexible fiberscopes is available in various configurations for any application. Valued throughout the world for their rugged versatility, Rovver® robotic crawlers include a distinctive modular design. The camera, control unit, cable reel and lighting are interchangeable on all three models, enabling a quick change from a 10 cm (4 in.) diameter to a 76 cm (30 in.) pipe in minutes with the same tool. Rovver robotic crawlers deliver full directional viewing in a horizontal pipeline with their pan-and-tilt or forward-only viewing color video cameras. Both cameras have remote adjustable focus, providing a clear view at all times. 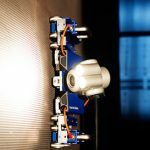 GE’s Inspection Technologies business offers a full range of Solarc®-powered metal-halide light sources that work in tandem with rigid borescopes and fiberscopes. Our 60-watt and 24-watt, metal-halide light sources incorporate patented, field-proven arc lamps. This sophisticated lamp technology delivers superior images by uniformly illuminating the entire viewing range with high quality, white light. GE Measurement & Control Solutions also offers conventional 300-watt xenon lamps and high intensity ultraviolet models for RVI needs. At GE’s Inspection Technologies business, we provide the necessary software tools to make your remote visual inspection (RVI) job easier and more productive. Our RVI NDT software range includes Rhythm® Visual, a state-of-the-art image acquisition, review and data management solution, Menu Directed Inspection (MDI) for guided inspection and automatic report generation, Inspection Manager for image re-measurement and iView Remote for remote control. 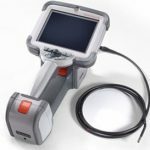 GE’s Inspection Technologies business offers a wide range of useful accessories that enhance the usefulness of our comprehensive line of Remote Visual Inspection equipment. 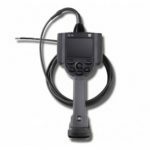 Designed to handle a variety of applications, these accessories include companion systems, retrieval tools, high-resolution video monitors and more.